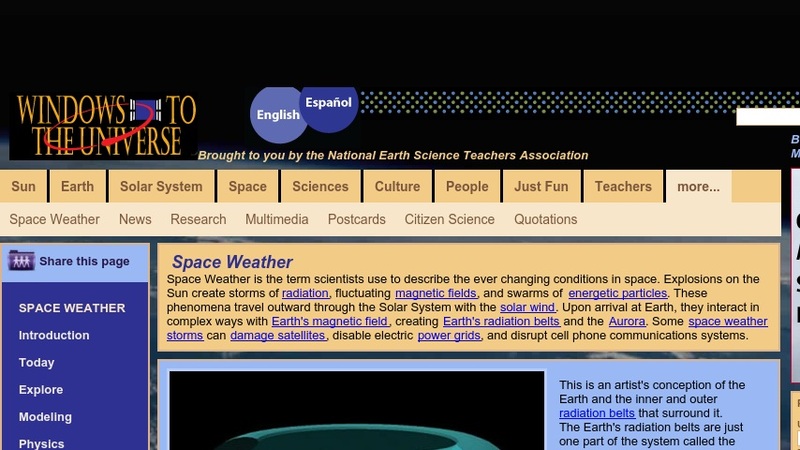 With three levels to choose from on each page - beginner, intermediate or advanced - this site provides information on Space Weather and the terms scientists use to describe the everchanging conditions in space. Explosions on the Sun create storms of radiation, fluctuating magnetic fields, and swarms of energetic particles. These phenomena travel outward through the Solar System with the solar wind. Upon arrival at Earth, they interact in complex ways with Earth's magnetic field, creating Earth's radiation belts and the Aurora. Some space weather storms can damage satellites, disable electric power grids, and disrupt cell phone communications systems. This site provides images, activities, and interesting facts about all of these events.